Andrey Ponasyuk is alive after he was exchanged with Russian POWs. BUT... their car got ambushed and attacked when they drove back! Yet this turned out to be a mistake, which they have corrected now. It did cause confusion, but it does not take away from the fact that he was tortured and badly mistreated. When it turned out that Andrey still seemed to be alive, we pressed for and kept looking for real signs of live from him. Several videos by a new channel ICORPUS had been made of him in a couple of days being in some hospital. One video was used for Propaganda lies by falsely accusing him of setting fire in the Odessa trade building. 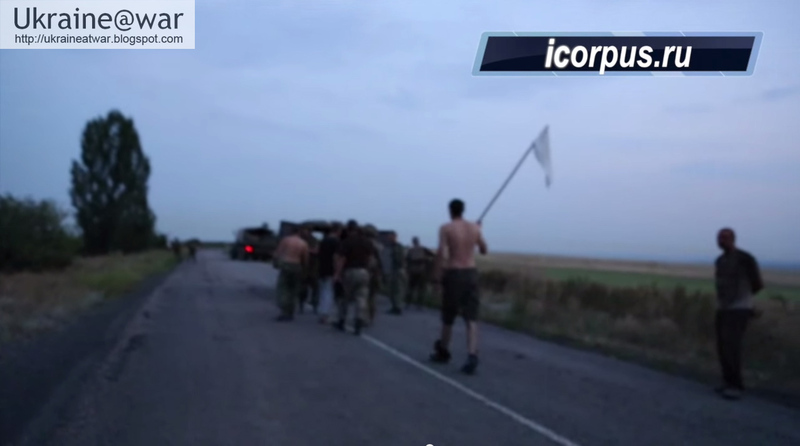 On August 12th a video from ICORPUS was released proving that he was with his mother. He and three other POWs were exchanged against Russian POWs (7 can be seen in the video). Still, this was not enough for me. It could have been staged, or the Ukrainian car could have been attacked after taking the video, or they could have been recaptured. Russian terrorists can not be trusted. Recently a helicopter to carry wounded Ukrainian soldiers from the battlefield had been shot down. A civilian evacuation transport carrying a white flag had been attacked killing some 15 people (see this blog). Etcetera. So I asked several people to check his VK-page (https://vk.com/id23976359.) which is hidden, for signs of live. But without success so far. His mother came to Donetsk on August 3rd and was detained. She was detained and held at the local SBU without anybody being able to reach her. After negotiations with the Ukrainian military they made an exchange on 08/11/14 (11 terrorists exchanged for 4 wounded prisoners), Andrey was one of them. Shortly after the exchange, terrorists ambushed the vehicle with mortar fire (? not sure of translation). Two wounded. One individual covered his mother and was wounded. One person was killed. Everyone who was alive ran to a corn field, and they dragged Andrey with them. They were rescued by Ukrainian forces and the terrorist attack was repulsed. DJP3tros: Wow... I feared for this. And right now he is in another military hospital in Ukraine. Unfortunately his wounds were poorly cared for. They treated his wounds once in two days, he has broken bones. And there is a risk of sepsis. The support group raised money for his treatment, I will try to help a little bit too. The article is written on August 15th. DJP3tros: Great. I will write blog about this soon. Mario: Thank you for what you do, it might just saved his life. Publicity helps. Andrey had 5.5 hrs surgery in Ukraine, but still has many fragments of shrapnel to be removed. He will undergo another surgery soon. They are trying to save his leg and the bone, he has his big toe surgically removed. His mother is terrified, she sounds completely helpless and wants her second son back home from the front lines. She is the kind of person who is shy to ask for help. DJP3tros: How much is needed for the operation? The mother is helpless and doesn't know her options. She is simple country woman. WHAT!!! I am happy that Andrey is alive, but these bastards DID attack the car after the video stopped recording! And one person died because of it. Because of all the publicity on Andrey, they could not kill him, but it would have been no problem for them if he would have died in their hospital. WHAT??? His mother comes visiting him and they detain her! They attack the car with her in it. Are they totally out of their minds! Ok... When you are Ukrainian think about supporting Andrey to get him a good treatment. When you are European, please do what you can to support Ukraine to stop this terror. Ask your government to help. Maybe you can arrange something where he can be treated well? When you are a politician, journalist or whatever: look... if Europe does not support Ukraine to stop this terror, one day this evil will knock our door. Remember MH17?